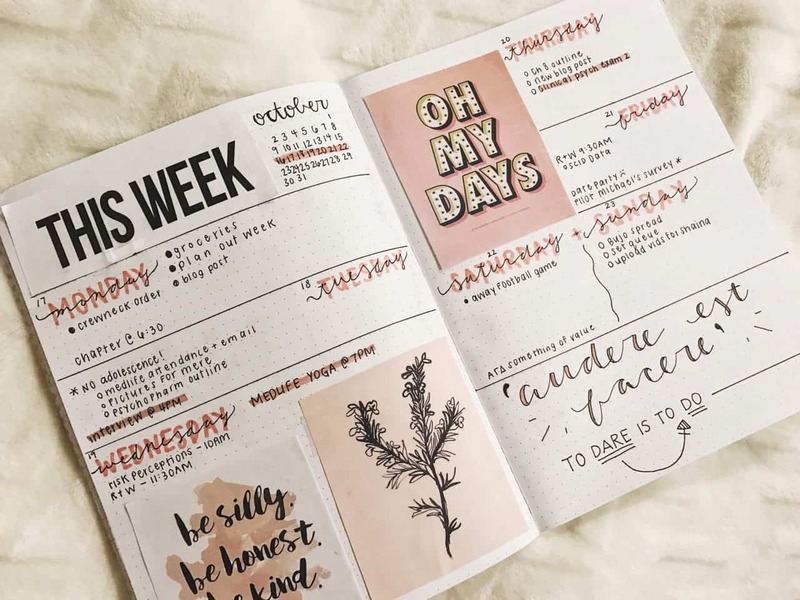 Life is super stressful and if you use a Bullet Journal to keep on top of things you’ll love these examples of self care journal ideas you can do right there in your BuJo to improve your wellbeing. 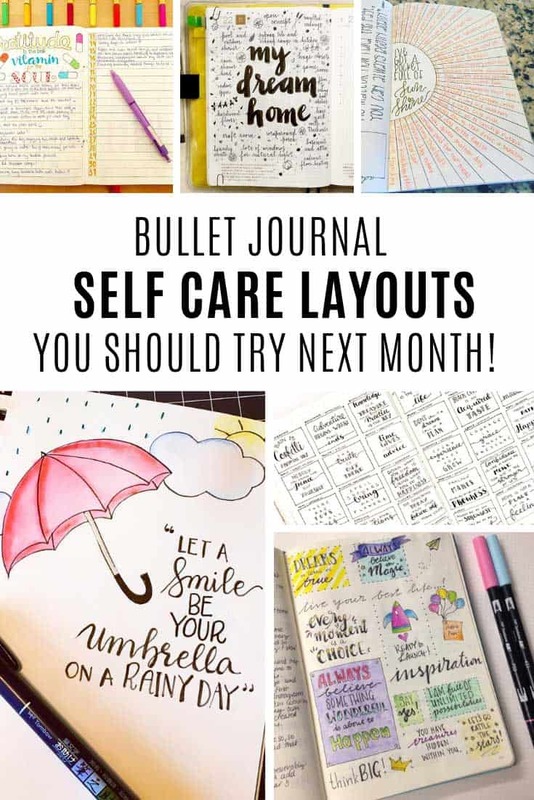 One of the things I love about the Bullet Journal is that it’s not “just” a planner, or a task list, it’s a journal too and so today I’ve been looking into examples of self care activities we can do in our BuJos. 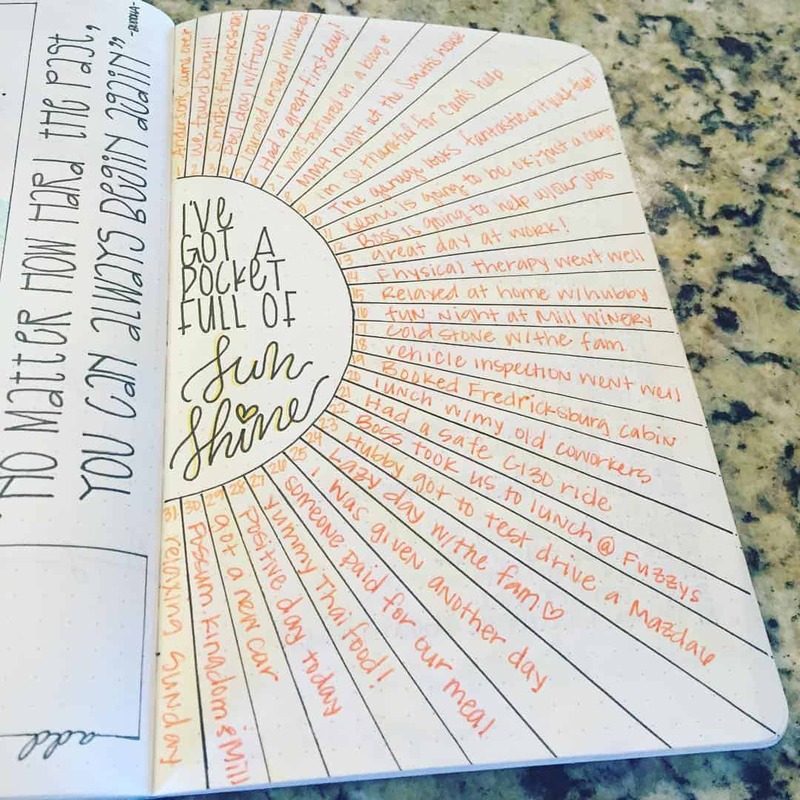 I found so many inspiring Bullet Journal Ideas to share with you. I wasn’t 100% sure how to explain “self care” so I looked it up and found this definition from the Self Care Forum. 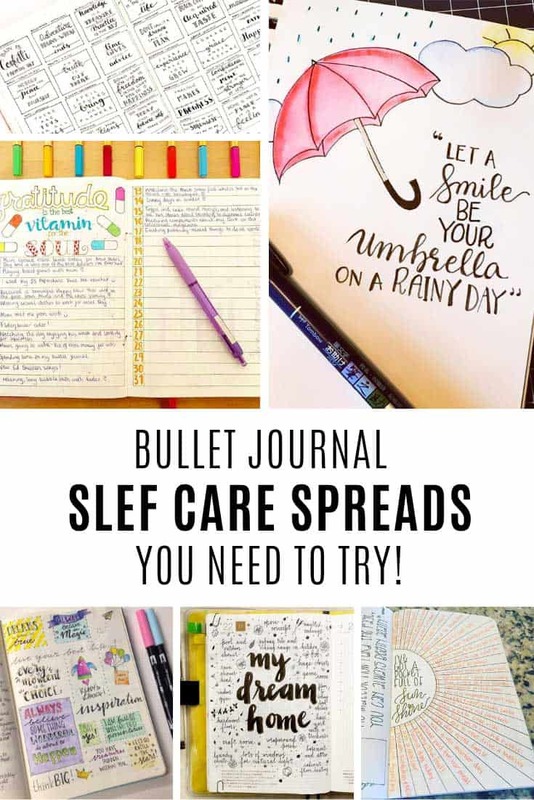 I’ve already shared some ideas about using your bullet journal for weight loss, which fits into caring for your physical health, so today I thought I’d look for different spreads and layouts to inspire us to care for our mental health. Don’t forget to scroll all the way to the end of the post to check out all the ideas, and save your favourite spreads and layouts to your Pinterest account so you can refer to them later. These days most of what we write is public updates on social media where we need to be careful about what we say. But your journal is meant to be private, which means there is absolutely no need to censor yourself. You are free to write down anything you feel, even the things you wouldn’t feel brave enough to share with your best friend or significant other. And you don’t even have to worry about your handwriting or your spelling! When you write what you truly feel it can be very freeing, and you will learn a lot about yourself. Of course this doesn’t necessarily come naturally so it’s a good idea to start with some writing prompts. I found this list of 52 self-discovery prompts that Megan put together over on Page Flutter and I think they’re a really good place to start. 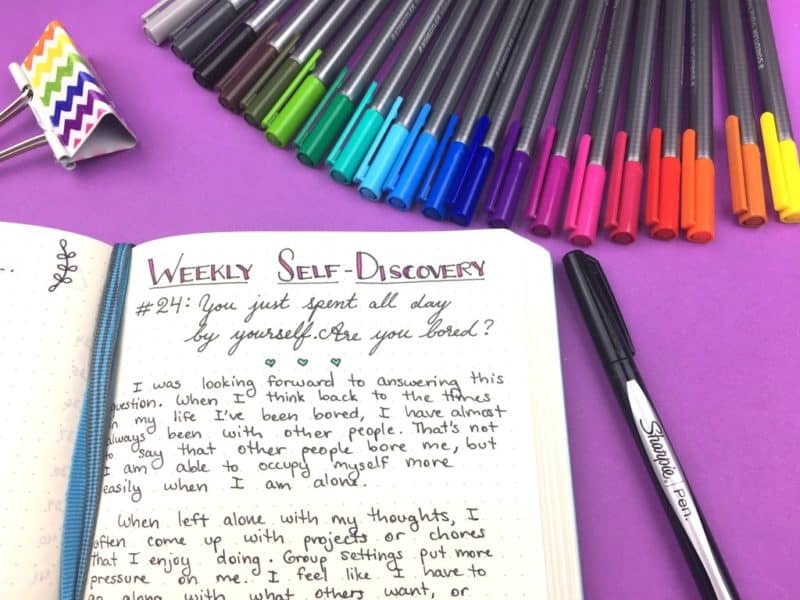 You might be keen to work through them as quickly as you can but try and slow down, pick one prompt per week, dedicate a whole page to it in your Bullet Journal and give your time to write what you really feel about each one. If you want to get creative and add illustrations or doodles then that’s entirely up to you! You know those days when things don’t go to plan? When you feel an inner rage or sadness that seems to be totally consuming? Those are the days when you need to grab your journal and write it out. Don’t worry about specific prompts, just take the words that are whirling around your mind and get them out on paper. It’s incredibly cathartic, and you might find that as you write the problems seem more manageable and you might be able to think of different ways you can deal with the situation. And once you have it down on paper, put it out of your mind and move on with the things in life that really matter to you. We all have things in life that make us happy, or that we are grateful for. Whether it’s coffee or chocolate, spending time with your significant other or watching your children giggle uncontrollably. Whatever those things are write them down. Every day if you can. Because when you see all of the things you are grateful for written down in a tangible list you can focus on really being happy about those things. And when you have a tough day you can read through your list and remind yourself of the things you are grateful for. 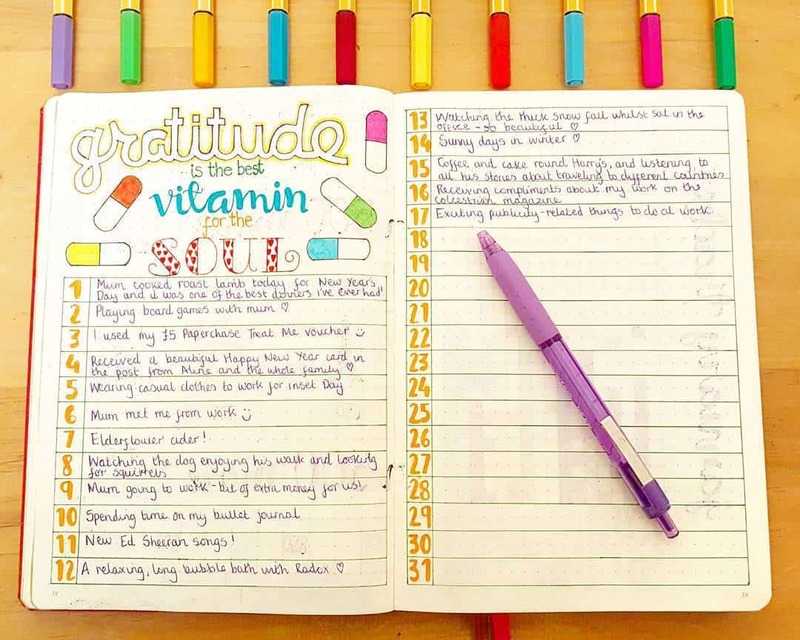 Here are some Bullet Journal gratitude ideas to inspire you. 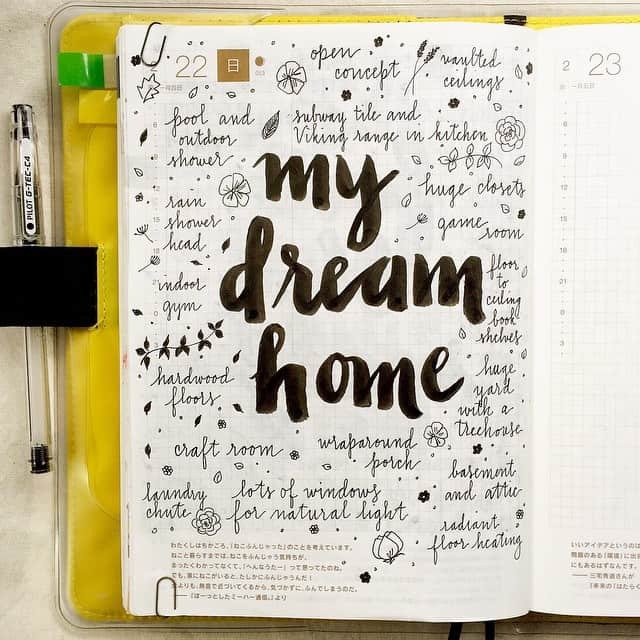 As always with a BuJo it’s up to you whether you simply write out a list, or whether you get creative with it! 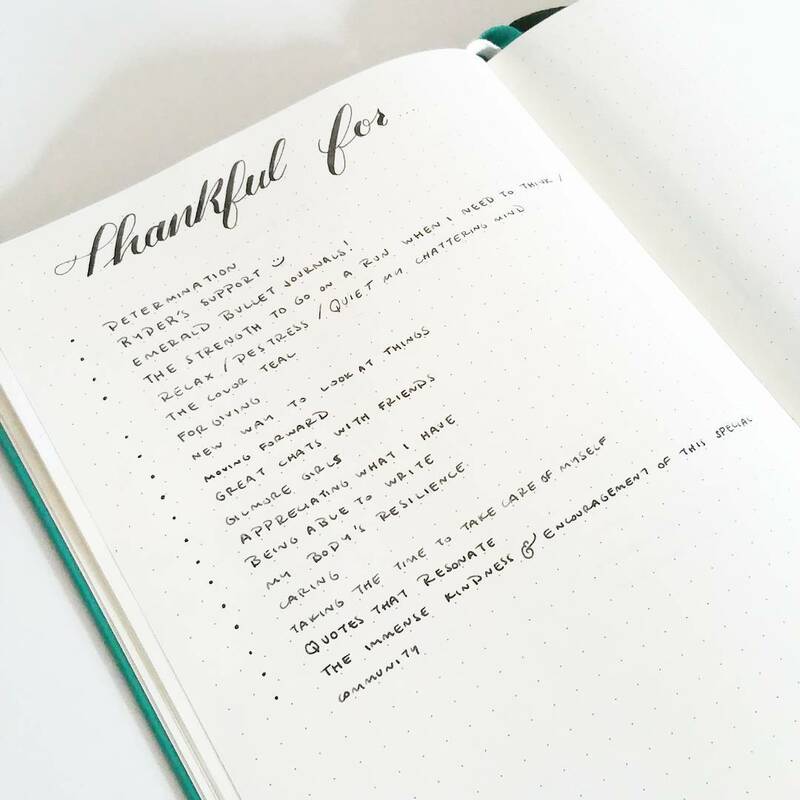 This gratitude spread is just a simple list, leave yourself two pages and write down one or two things every day. “Gratitude is the best vitamin for the soul”. 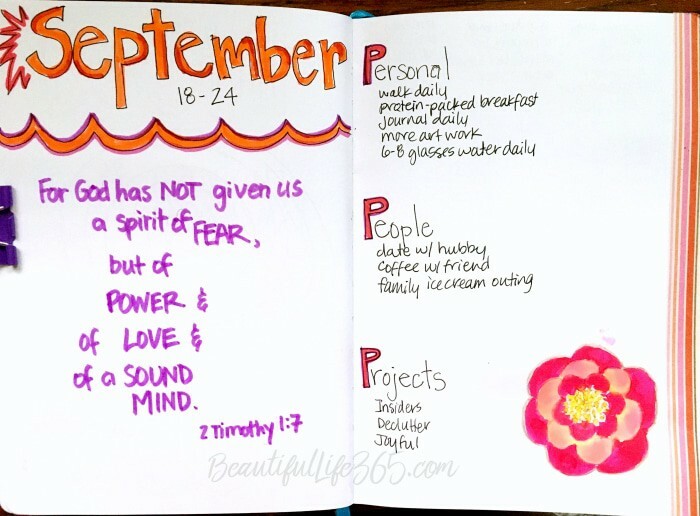 What a beautiful quote, and I love this spread that lets you note down one thing you are grateful every day for the month. “I’ve got a pocket full of sunshine”. I really like this gratitude spread that looks just like rays of sunshine filled with the things that make you happy. Every day we’re surrounded by inspirational words that uplift us. Whether they’re quotes from famous people, or from movies, or even song lyrics. 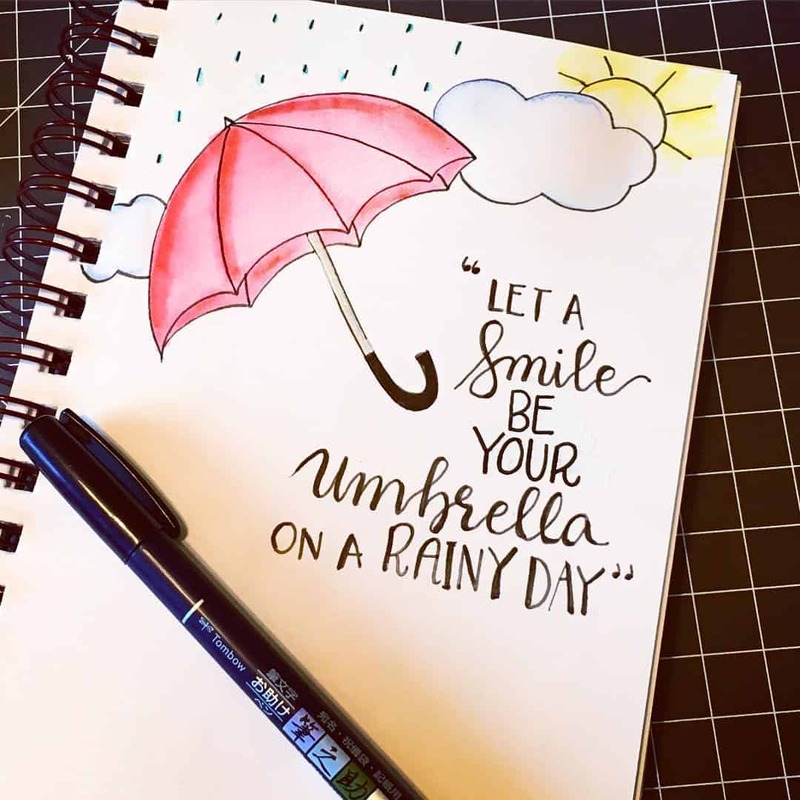 As part of your self care activities think about starting a quotes spread in your journal to write down your favourite uplifting words. You can go full colour. Or simple black and white. Dedicate a whole page to your favourite quote. Or record the quotes as part of your weekly spread. We often think of our hopes and dreams as wishes that could never possibly come true. We let people tell us that they’re too big, too silly, totally unattainable. But that doesn’t have to be the case at all. A study carried out a Californian university found that you are 42% more likely to achieve your goals and dreams, simply by wring them down. Apparently something super clever happens inside your brain when you dream up an idea and then commit it to paper that makes it more likely to come true. So grab your bullet journal and write down those dreams and goals. 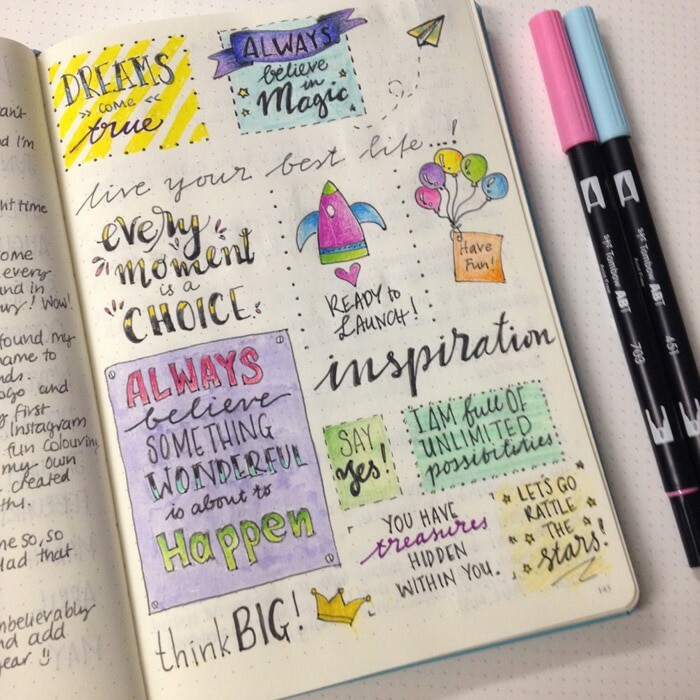 I found these spreads and layouts to inspire you. Use a mind map style layout to think about everything you want your dream to be. The more you can visualise what it will look like the more likely it will happen. 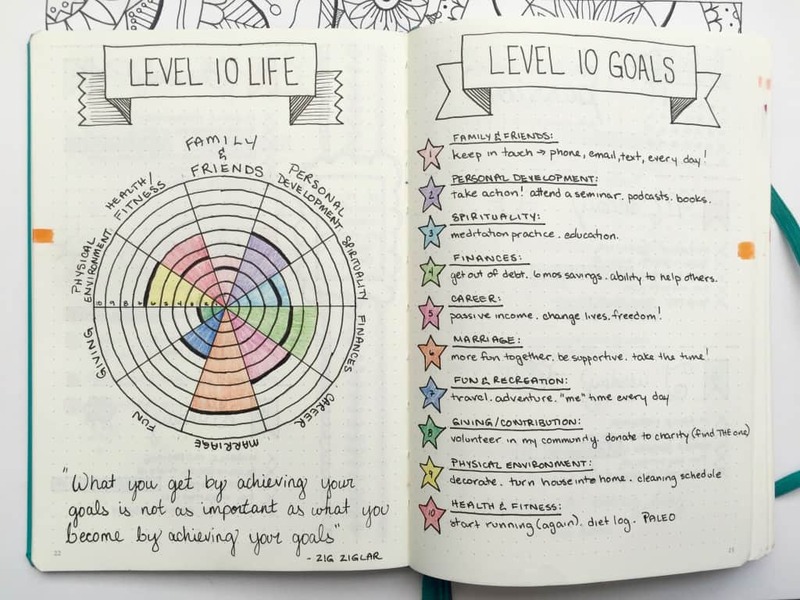 Use a Level 10 Life layout to think about your 100 goals across 10 different areas of your life. If setting 10 year goals feels overwhelming why not start with just your goals for the upcoming month. Or why not go old school and make yourself a vision board right there in your Bullet Journal by cutting up magazines! 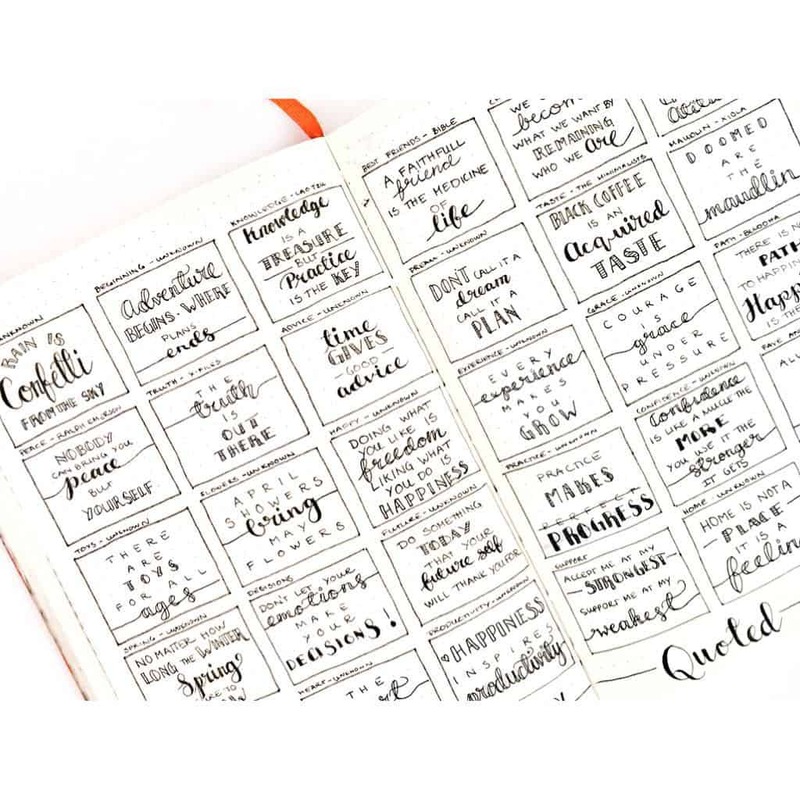 We all lead crazy busy lives, that’s why many of us turned to Bullet Journals in the first place I guess, as a way to try and keep on top of everything life throws at us. But the examples of self care activities we’ve looked at today don’t have to take a lot of time and they are an excellent form of stress relief. Give yourself five minutes during the day and use your journal for something other than a task list. Use one of the writing prompts, make a note of a favourite quote, heck just write out the alphabet! Whatever happens when you put your pen to paper just spend five minutes looking out for you.